The Stealers fell 20-7 to ThornLeigh at Oakleigh Park on Saturday. Andrew Lawrence went 2 for 2 and two of Stealers’ runs were scored thanks to timely hitting by Andrew. He singled in the second inning and tripled in the fourth inning, before injuring himself. Dave Van Coller recorded the win for ThornLeigh. He allowed four runs over three innings. He struck out four, walked one and surrendered six hits. ThornLeigh pounded Stealers pitching, as nine hitters combined for 17 hits, 17 RBIs and 17 runs scored. Gene Reis was the game’s losing pitcher. He allowed nine runs in 2 1/3 innings, walked three and struck out none. 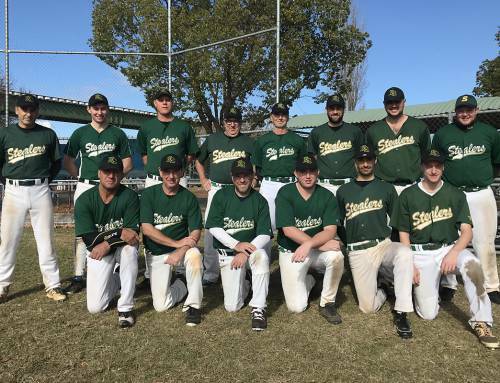 The game’s last lead went to ThornLeigh thanks to a first inning rally that saw seven runs cross the plate on an RBI double by Jeremey Aithison, a home run by Lucas Jones, and a two-run single by Luke Bayne. After pushing across three runs in the top of the second, Stealers faced just a 7-3 deficit. An RBI single by Michael Burrell, an RBI single by David Lane, and an RBI single by Andrew gave Stealers life. Gene struck out to end the Stealers threat. ThornLeigh responded with four runs in the second. ThornLeigh scored on an RBI single by Ben Lorento, a two-run single by Denis Melloy, and an RBI double by Aaron Rouden. One run in the top of the third helped Stealers close its deficit to 11-4. An RBI double by Aaron Duckworth set off Stealers rally. Finally, ThornLeigh pitching induced an inning-ending strike out from Kim Timmins. A three-run fourth inning helped bring Stealers within seven. An RBI double by Duncan Balmer, an RBI triple by Andrew, and an RBI single by Gene fueled Stealers’ comeback. Faham Hussian got the last out, as Stealers’ Aryia Iwato flew out. The Stealers Road Trip continues next week againist Baulkham Hills before returning home for the last game of 2013.